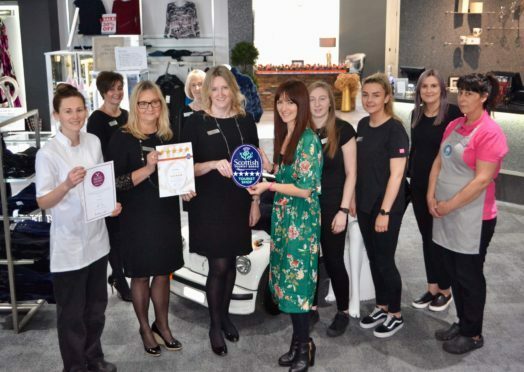 Jo Robinson, VisitScotland Regional Director is pictured presenting a 5 Star plaque and Taste Our Best certificate to owners of The Platform and Annie’s Cakery, Elaine Williams and Annie Anderson, who are joined by their staff. A former north-east railway station which has been transformed into a tourist shop has landed a major accolade. The Platform in Macduff is well and truly on the right track after being handed a five-star tourist award from Visit Scotland. It was the store’s first-ever grading from the country’s national tourism organisation. The Platform and its cafe, Annie’s Cakery, is based at the old Macduff train station, which closed to passengers to 1951 and to freight a decade later. Prior to handing out the ratings, Visit Scotland considered a raft of criteria including the attitude of staff, cleanliness and layout. Elaine Williams, the manager at the Platform, said she was “delighted” they had managed to secure the title. She added: “We are absolutely delighted that The Platform has been awarded its five-star status. This is a testament to both the dedication of the staff and the support we have received from our valued customers. Jo Robinson, Regional Director at VisitScotland, said: “It is fantastic to see Aberdeenshire’s tourism offering enhanced by The Platform and Annie’s Cakery, and their well-deserved achievements. “Achieving these awards at their very first grading visit is particularly impressive. “The Platform is an exceptional example of a business that is working in partnership with VisitScotland – making the most of our opportunities and drawing on the impartial advice and experience to invest in and develop their business.